MILWAUKEE — When Brewers owner Mark Attanasio was interviewing candidates in 2015 to take over as Milwaukee’s general manager, he was careful to gauge how they felt about keeping Craig Counsell as the team’s manager. He interviewed more than a half dozen people, and for each one, he paid close attention to how they reacted to Counsell’s name. He went with David Stearns, announcing the hire in September 2015, but Attanasio said that of the seven or eight people he interviewed, not a single one gave any indication that they wouldn’t have wanted to work with Counsell, despite him having no direct managerial experience before 2015. “I’m pretty attuned to watching body language, and nobody had a problem with that,” Attanasio said. With the Brewers in the NLCS after a 96-win season, those instincts have proved correct. Perhaps that’s because Counsell had essentially been an unofficial manager-in-training since his playing days. “I’m a product of my experiences and the people that I’ve been around and the people I’ve watched do this job,” Counsell said. “I tried to soak everything in that they did,” Counsell said. “He kind of allowed me behind the curtain of managing as a player, which was a rare opportunity, and took the time to explain things to me about why this and why that and what I’m thinking here, that sometimes it’s hard to figure out as a player,” he said. Counsell went on to play for several more years, leaving the Diamondbacks for his hometown team. Counsell grew up in Milwaukee, graduating from Whitefish Bay High School on the city’s north side. Those playoff games in 2011 turned out to be the last of Counsell’s playing career. He got only four at-bats that October, but the experience has helped him as a manager, he said. Counsell joked before this year’s NLDS started that not playing much in the 2011 postseason gave him time to think about how he might manage. 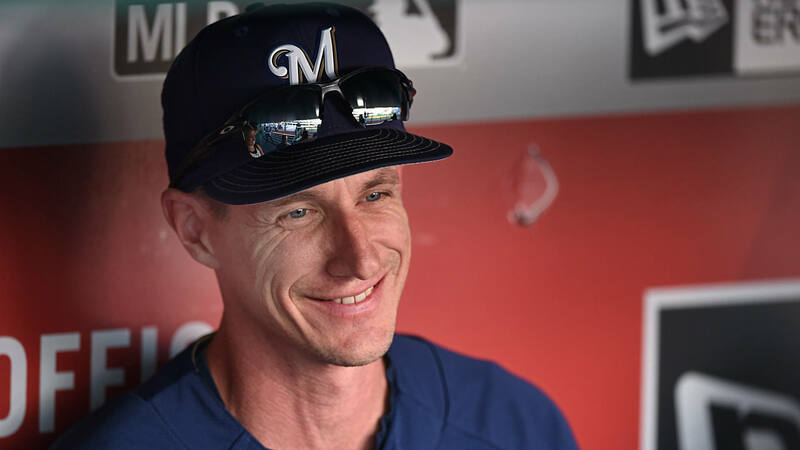 “When you’re in that stage of your career, you do put yourself in that position of thinking about what the manager is doing, and I think that’s kind of natural for guys that are on the bench at the end of their career and are sitting on the bench most days,” Counsell said. “I’m a Milwaukee kid, and so to take part in that as a Milwaukee kid and have some responsibility of what’s going on here, it’s really meaningful,” he said. “He’s had a tough job, I think. He’s had a lot of guys, a lot of options, especially in the lineup. And he has to keep everybody happy. And I think he’s done a pretty good job of that,” infielder Travis Shaw said. Shaw joined the Brewers via trade in December 2016, after serving as Boston’s third baseman for two seasons. When third baseman Mike Moustakas joined the team at the trade deadline this year, Shaw said that the culture Counsell had built helped him embrace a move to second base, a position he had never played in the majors. First baseman Jesus Aguilar is in a somewhat similar position, having largely taken over first base from Eric Thames. It’s led to an emergence of sorts for Aguilar, whose 35-homer, .890 OPS regular season was good for a fan vote All-Star nod in July. “He’s a great leader. He did an outstanding job,” Aguilar said of the lineup juggling Counsell has had to do. Now, the Brewers are in the NLCS, their first postseason appearance since 2011. Attanasio says that hiring David Stearns and keeping Counsell at the helm in the dugout are two of the smartest decisions he’s made. Counsell’s experiences under Leyland and Melvin prepared him for the job, and the results are hard to argue against. “Win a World Series for the Milwaukee Brewers,” Attanasio said.